Trade Deadline and the Player Collection: What To Do Now? March 3, 2010 represented this year’s NHL trade deadline. This year was one of the best and worst all wrapped up together. We had big moves before the Olympic roster freeze, with names like Kovalchuk, Phaneuf, Giguere, Jokinen switching teams. On the actual deadline day, we saw a record number of deals completed (although most if not all were interchangeable parts moving), with the biggest names being Wolski and Mueller. Being a player collector in this hobby can be tough, especially if you are collecting a mucker, or a banger. It can be even tougher if he also plays on your favorite team. I was lucky when this deadline day arrived: one of my top players got moved, as Clarke MacArthur was traded from the Buffalo Sabres to the Atlanta Thrashers. Personally I am not worried, as I can continue my collection without missing a beat (although since his rookie year, there have not been too many to collect overall). I like his game, and I like what he did at the World Juniors a few years back. The fact that he has zero association to my Montreal Canadiens makes that decision so much easier. For me, but not for everyone. As an active member of a few different message boards, I have seen it every off season, and every trade deadline. People who heavily collect their favorite player on their favorite team see him get moved in a trade or sign on with another team in the offseason. The question inevitably comes to this: Now what? Trade or sell the player collection. Sometimes the team draw is too strong for the player. I can see this: most times you cheer for your team, your team acquires player X, who then becomes your favorite player. When player X is moved, you go through a full gamut of emotions . . . from disbelief, to acceptance, to wondering what to do with your prized collection (not to mention the time, effort and money put into it). Do I still collect him? Can I still cheer for him now that he is on the hated (fill in new team here)? To the point of making the decision to give it up, your love for your favorite team is too strong. Now to find someone in the exact opposite boat as you, someone who is a fan of your former collection’s new team, maybe they need to have all of his rookie cards, the shiny inserts you have accumulated, maybe the autographs and game used cards; they all need new homes. In a couple of months, I will have forgotten that I even collected player X, and have now moved my focus to player Y, and building up the best collection I can of him. Sometimes the player is your reason for loving the team in the first place. Or maybe there is another reason why player X is your man. It could be that you played hockey with or against him when you were younger. Or maybe he played for your favorite junior team, or for your college when you were there. Regardless, player X is your man through thick and thin. Where he goes, you go with him. Sometimes it is fun to collect some new items, and you look forward to the newest releases of player X with his new team. You will go through a year, or sometimes two years (depending on how popular your player is) of seeing him in a new uniform until you can get some new jersey and patch pieces It provides a new exhilaration and rejuvenation for you to get your act together and grab those remaining cards of your man before new ones hit the market with the new team. Maybe with player X moving, some of the other collectors of his cards will give their collections up and you can cherry pick some of the nicer items that slipped through the cracks, or that you simply didn’t have the funds to acquire when they first became available. Weekly searches on buy/sell sites become daily. It’s fun to be a player collector again! Keep the Collection, but re-focus it. This often times represents only collection cards of player X while he was on team Y. You will limit your collection to items that were released during his time with your team. Sometimes the focus gets even narrower; rookie cards, autographs and game used cards. Whatever the case becomes, you are not willing to divest all of your assets but in order to start up something new, you need to focus things, keep only your favorite or most prized possessions in the collection. You can sell off or trade some of the more common ones to another collector who has more desire to keep things going large scale or to a new collector for a starter collection. Vault it, start a new one. In some instances, collectors will just shelve the collection. They have invested heavily into it, and refuse to move it for dimes on the dollar, but the wind is out of the sails. They keep the collection right where it is and start over with something new. Sometimes they’ll start with a new set (to give the player collecting a bit of a break, it can be draining), or hop right into a new collection (who to collect now?) Typically, this option comes with a lot of reflection, and often the collector will struggle with things for a period of time while they make the decision to continue on. Choosing a new player collection usually comes with deep thought as well. Do you go for a rookie, start with all the true rookie cards, grab as many parallels as you can, or go at it 100%? Do you choose your favorite team’s newest acquisition (perhaps you know someone is going to try and off load their collection so you can get a good start)? Maybe it is time to start a collection of a retired guy who played for your team, or was an important player who your parents looked up to? With so many choices, it is no wonder why so many collectors take so much time in thinking about who they are going to collect, and how they want to do it. Personally, I have a few player collections that I do different things with. It keeps me happy, enthusiastic about collecting and I rarely go through any days where the chase disappoints me. Clarke MacArthur: I go at this player 100%. I am missing some key elements from his rookie year, namely high end 1/1’s from The Cup, as well as some rare parallels from this year. Those OPC blank backs and the Collector’s Choice Prime Choice Reserves are tough. What makes this fun for me is the overall chase; knowing there are only limited cards and rare finds left to be had. P.K. Subban: P.K. had some memorable matchups as a member of the Belleville Bulls in the OHL against my hometown Kitchener Rangers. Drafted by my favorite team, the Montreal Canadiens, he seemed to be a logical fit. 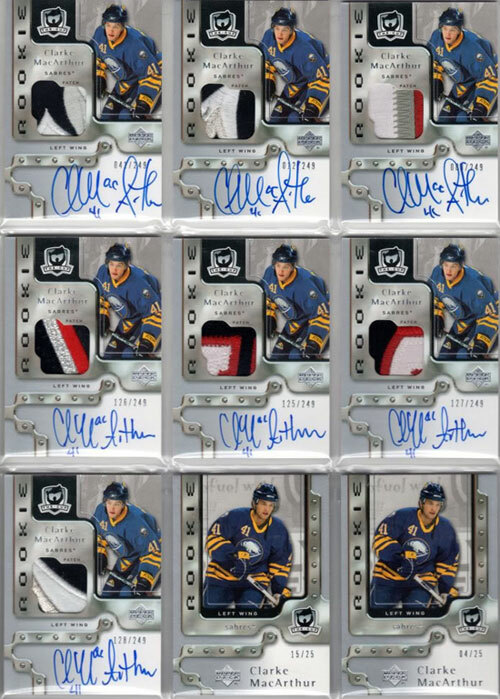 Having just made his NHL debut recently, I will be bombarded with Rookie Cards of his to chase starting in the 2010/11 season, and I will have to assess where I want my collection to go from here. I only have his minor league issues to chase right now, and am down to needing three cards, including all known 1/1’s. These three cards have a combined print run of 12. Yikes. David Clarkson: I know David personally, and this is where my collection of him comes in. 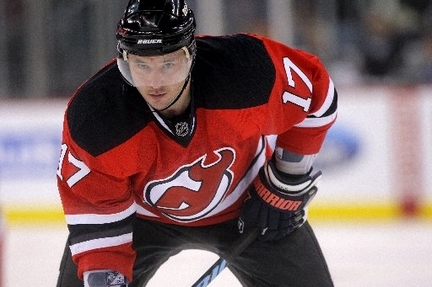 David is a great guy, grounded, level headed, and turning into an important player for the New Jersey Devils, (but having a tough year with injuries). For him, my focus is strictly on his rookie year. I have some rare parallels that I still need to acquire, not focusing in on any 1/1’s (as I have a friend who goes at him much stronger then I do), and anything I add on top of that is simply gravy. 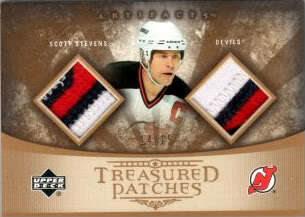 Scott Stevens: Hometown boy who actually went to school with my aunt, and I have had the pleasure of meeting him on various occasions when he makes his way back home. 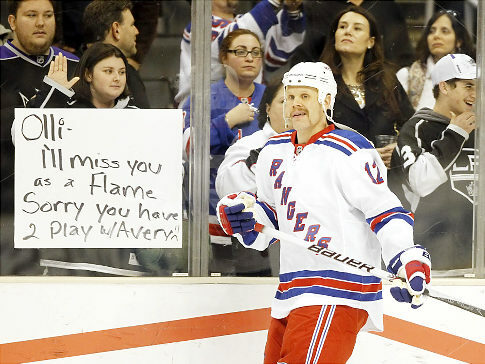 He still looks like he could play, and is every bit the Hall of Fame person as he is Hall of Fame hockey player. My focus for him is game-used cards, and everything else is fun times. I don’t go out of my way to buy them, but if I can trade for them, or if the price is right, I will grab them. This is probably the least stressful of my collections and arguably the most fun to collect. I am always really excited to add items to this collection. 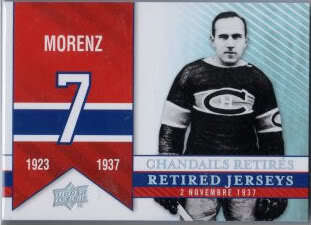 Howie Morenz: My favorite team’s first true superstar. My focus here is with modern releases (1950-present), mostly on non 1/1 game used equipment. At a young age I read about Morenz and fell in love with the story. This is by no means a cheap collection to hold, so the acquisitions are tough to come by, but very satisfying when I manage to get them. Not many of his items come available by trade, so I can only try and have funds available when something presents itself. I try and keep this one low stress, as there are lots of collectors out there with deeper pockets then I, and many of the items are quite limited. Getting to 100% isn’t really an option for me, but again for me, I love the chase. We would love to hear how you look at your collections and how you choose to collect who you do and what kinds of limitations you use. Now that deadline day is over, player collectors can take a deep breath, and continue on . . . until the draft and free agency, and you may have to look at altering your collection all over again! Don’t forget to register your 2009-2010 NHL Rookie cards. Click here to register them at Upper Deck’s Rookie Card tracker. By registering your codes from the back of your rookie cards, you will have a chance to win a box of cards from Upper Deck! Christopher Carmichael has been hockey fan of over 20 years. He has been an active member on various hobby related sites, most notably www.hobbyinsider.net, and www.cloutsnchara.com. Christopher is also a long time collector, with a focus on a few select player collections, and the occasional set projects. Very cool to read about your player collections and why/how you collect each player. I collect two players fairly seriously and a few others mainly if I find an interesting card. My main man is Sheldon Souray, because he was born in my hometown and he’s a great guy. I aim for one of each of his base cards, but not necessarily every parallel in every set, and every auto variation I can get. I’ll work on the parallels later, maybe after he retires or something. I’d love to get my hands on some printing plates, but there are so few around. I’d also love to get, say, all 10 of a set of 10. I’m working on a set of 15, having collected 4, but that might be too ambitious. My second fave is Mark Letestu, a Pens rookie that I went to high school with. He’s a great kid and since I work with his dad, I’ve managed to collect a stack of different cards. I have all 3 years of his regular AHL cards, and 5 different colored jersey cards from the last two years. Now that he’s played some games in the show, he has some NHL cards that I’ve managed to grab. Nothing too hard to get yet, especially with my connection, but time will tell. The rest of the players I collect are mostly from my hometown area, and I just grab random cards whenever I see them, ranging from junior cards, autos, jerseys, and SPs. I do have a soft spot for former members of my favorite WHL team though, so I keep a decent sampling of their cards around, from jersey cards to other junior teams they’ve played for.